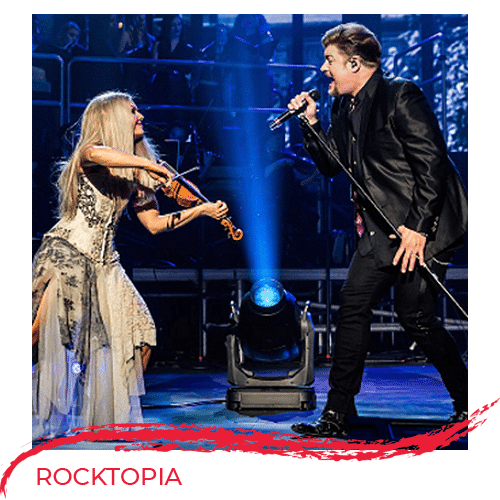 Rocktopia is a musical revolution that fuses great classical music with some of the best rock songs of the past century. Rocktopia showcases the works of musical innovators, from Mozart to Journey, Handel to U2, and Beethoven to The Who, plus Tchaikovsky, Styx, Pink Floyd, Copland, and more! Developed over eight years, Rocktopia was created through the unique vision of vocalist and recording artist Rob Evan — from Broadway’s Jekyll and Hyde, Les Miserables, and a member of the Trans-Siberian Orchestra — and Maestro Randall Craig Fleischer, a pioneer in the fusion of symphonic rock and world music. Rocktopia delivers spine-tingling musical arrangements with talented vocalists, a five-piece rock band, a choir, and a 20-person orchestra! 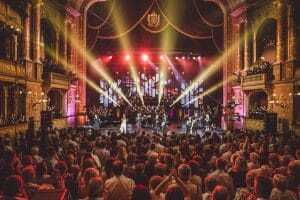 Experience all the fun of Rocktopia with the dynamic new special Rocktopia Live in Budapest: A Classical (R)evolution, filmed live at the Hungarian State Opera House. See it on CPTV in a special presentation that includes information on an upcoming Rocktopia performance in Connecticut — and learn about exclusive ticket opportunities, including meet-and-greet opportunities! For more information on these tickets, visit CPTV’s Red Carpet page here>>. On CPTV: Wednesday, September 5, 2018 at 9:30 p.m.